The goal of most commercial koi food manufacturers is to produce a nutritionally balanced diet that offers growth and health, enhances appearance and is easily digested by koi fish, all this with very minimal waste. As koi hobbyists we’ve come to expect only the best for our pets, and we want it all at a fair price, too. The first step in making a good koi food is to formulate the diet or recipe, using only the finest, high-quality ingredients. Any food produced with sub-standard ingredients or inferior quality materials is certain to have an adverse impact on the future condition of the fish to which it is being fed. If manufactured diets are not balanced and not digested effectively by the fish, excess waste will be expelled and heighten pollutants in the pond water. To understand just what makes a good koi food you must first understand each vital part of its make-up. The main component of commercial koi diets is protein. Protein level is of utmost importance for koi use it to build new tissue and enzymes and to provide energy. Proteins are built from molecules of amino acids, so the level of amino acids is very important in koi food, too. There are 10 essential amino acids required. A feed containing a high protein level yet low amino acids may very well be inferior to a feed that contains much less protein. 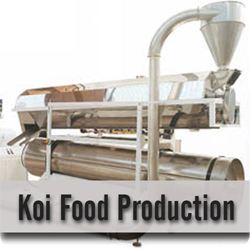 Protein comes from many sources but the protein source most generally used in koi food is derived from fishmeal. Freshness of the fishmeal is crucial as any level of spoilage causes the nutritional value to plummet. Spoiling also increases the possibility of potentially toxic substances to be formed in the food. Lipids or fats are essential in a koi diet. Fats are the primary and best energy source for fish. They also aid in the fish’s absorption of fat-soluble vitamins. 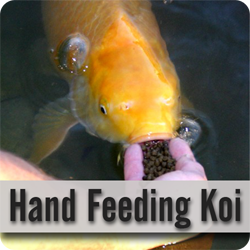 It’s crucial that koi feed contain a correct ratio of lipids to protein and carbohydrates. Fish oil is the principal source of fat in koi food and an excellent source of omega-3 (EPA & DHA). DHA can also be derived from algae, but is pricey. Just like protein, lipids vary in quality depending on the fatty acids they contain. Vegetable oils or fats derived from mammals can also be used. Fish oils are poly-unsaturated fatty acids which are particularly prone to oxidation, turning rancid. Rancid fats have an undesirable effect on some of the nutrients in the feed, in turn having an adverse effect on the fish. Liver disease in koi has been linked to feeding rancid fats. Antioxidants are added to protect the fats from turning rancid. Koi hobbyists are advised to dispose of any feed which smells rancid. A number of different vegetable and cereal by-products (starch) are used in fish diets. The energy that fish receive from the grain is required in order to utilize the amino acids, or proteins. Varieties often used are wheat, corn, potato, and sorghum. Vitamins and minerals are required in small amounts in a good koi food, yet they play a vital role in the fish’s health and metabolism. The lack of or use of poor quality vitamins and minerals can result in inferior growth and condition, even leading to diseases in fish. Vitamin C is essential for providing resistance to illness as well as boosting tissue repair. Currently a new type of the vitamin, phosphorylated Vitamin C has become available which is far more resistant to the heat treatment it is subjected to during the extrusion process. This version is referred to as Stabilized Vitamin C and is ideal for extruded feeds. Minerals such as calcium and phosphorus are important for bone strength and magnesium is needed for the fish’s metabolism function. Potassium and sodium are required for proper nerve function. Other vitamins and minerals are required but in trace amounts and are commonly listed on a label as a vitamin & mineral-pack. Obviously, color of the koi is important to its owner. Dietary additives can enhance a koi’s natural coloration. Koi colors are determined by its genetics, yet the food they receive also plays a significant part in bringing out the colors to their best effect. For the red color especially, the supply of carotenoid pigments in the feed is essential. Koi eat living organisms like crayfish that are high in carotenoids in nature and store the pigments in the body cells. Since crayfish are one of koi’s natural food sources they absorb the carotenoids from a very young age. 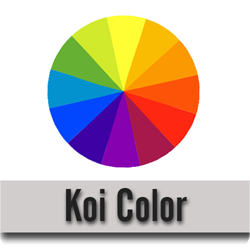 In koi feed the colorants are added as animal and vegetable sources; krill and spirulina algae. Be advised that if too much is added, the white background of the koi may fade or become ‘dirty’. Some koi enthusiasts believe that no koi feed should be without spirulina algae as one of its ingredients. Other carotenoids that are blended into koi feed are beta-carotene, astaxanthin and canthaxanthin. However, no amount of color enhancers will halt or reverse the loss of Hi (red) if it disappears. The ingredients used in koi food formulas and the methods in which they are processed affect the nutrient quality of the end product. Your pets deserve to be fed only a top-notch diet. Remember that they are in a controlled environment and rely on the koi keeper to supply a well balance food that supplies energy and nutrients to ensure optimal health, growth and condition.